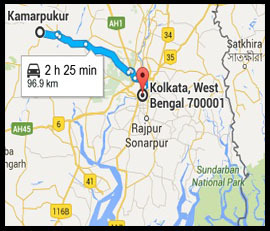 Kamarpukur is a village situated in the Arambag subdivision of the Hooghly District in West Bengal state of India. 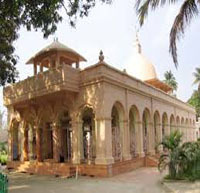 It is famous for being the birthplace of Ramakrishna. It is the block headquarters of the Goghat –II community development block. It was at Kamarpukur which is adorned with the beauty of nature and evergreens, that Sri Ramakrishna Paramahamsa was born in 1836 in a poor brahmin family. With his advent and on account of the frequent visits of his disciples and devotees, this hamlet has become a place of pilgrimage. Thousands visit it every year from the various parts of the world and get spiritually refreshed and elevated. Through the help of the devotees and the management, and of the monks of the Ramakrishna Math and Ramakrishna Mission, the beautiful temple of Bhagavan Sri Ramakrishna, with his marble statue installed in it, was built in 1951 at Kamarpukur. With the construction of guest houses, a library, a dispensary and schools and the re-excavation of the tank called Haldarpukur, as also with the development of the surroundings, the place has really become one of the beauty-spots in the whole locality.